Over the last 20 years, the average excess return on stocks over Treasury bills follows a bi-weekly pattern over the Federal Open Market Committee meeting cycle. The equity premium over this 20-year period was earned entirely in weeks 0, 2, 4 and 6 in FOMC cycle time, with week 0 starting the day before a scheduled FOMC announcement day. The paper can be downloaded from here http://faculty.haas.berkeley.edu/vissing/CieslakMorseVissing.pdf. 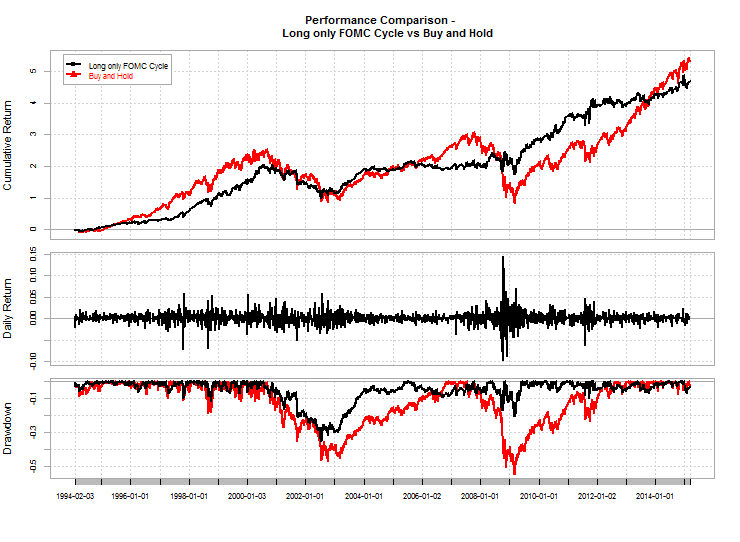 Although the authors used 20 years of excess return data from 1994 to 2013, instead we’ll use S&P500 ETF (SPY) data from 1994 to March 2015 and the FOMC dates (from my previous post here http://www.returnandrisk.com/2015/01/fomc-dates-full-history-web-scrape.html). As there is not a lot of out-of-sample data since the release of the paper in 2014, we’ll use all the data to detect the pattern, and then proceed to check the impact of transaction costs on the economic significance of one possible FOMC cycle trading strategy. 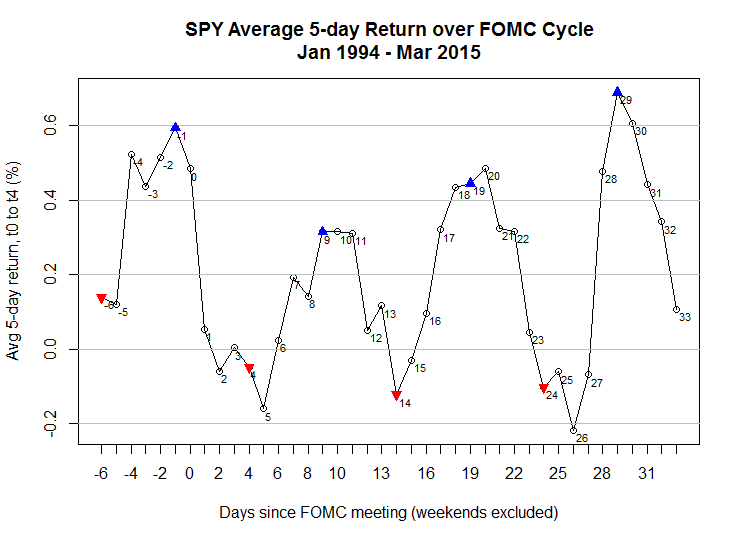 The chart and table below clearly show the bi-weekly pattern over the FOMC Cycle of Cieslak et al in SPY 5-day returns. This is based on calendar weekdays (i.e. day count includes holidays), with week 0 starting one day before a scheduled FOMC announcement day (i.e. on day -1). Returns in even weeks (weeks 0, 2, 4, 6) are positive, while those in odd weeks (weeks -1, 1, 3, 5) are lower and mostly slightly negative. Based on the paper’s main result and our table above confirming the high-phase is more profitable, we’ll backtest a long only strategy that buys the SPY on even weeks (weeks 0, 2, 4, 6) and holds for 5 calendar days only, and compare it to a buy and hold strategy. In addition, we’ll look at the effect of transaction costs on overall returns. The following are the resulting performance metrics for the trading strategy, using 5 basis points for transaction costs, and comparisons with the passive buy and hold strategy (before and after transaction costs). We were able to clearly see the bi-weekly pattern over the FOMC cycle using SPY data, a la Cieslak, Morse and Vissing-Jorgensen. Before transaction costs, we were able to reproduce similar results to the paper, with the long only strategy of buying the SPY in even weeks and holding for 5 days. In our case, this strategy added about 2% p.a. 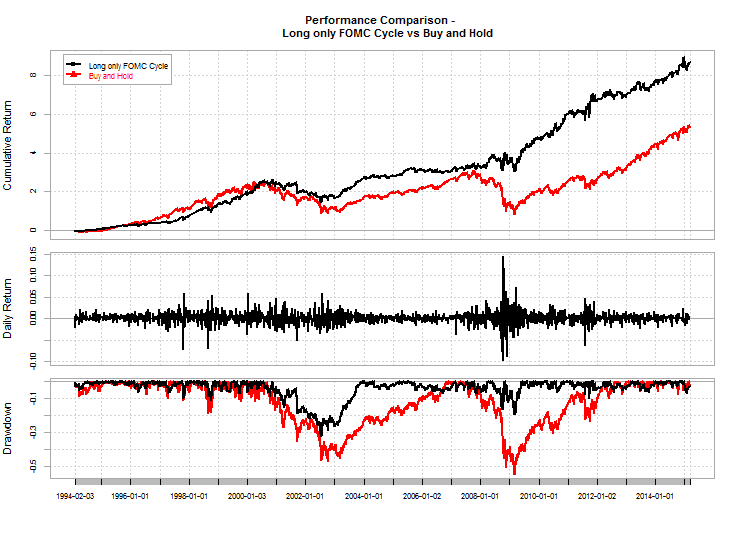 to buy and hold returns, reduced volatility by 30% and increased the Sharpe ratio by 70% to 0.82 (from 0.47). However, after allowing for a reasonable 5 basis points (0.05%) in execution costs, annualized returns fall below that of the buy and hold strategy (9.15%) to 8.55%. As volatility remains lower, this means the risk-adjusted performance is better by only 30% now (Sharpe ratio of 0.62). See table below for details. There is a bit of a learning curve with the Quantstrat package but once you get used to it, it’s a solid backtesting platform. In addition, it has other capabilities like optimization and walk-forward testing. It's a feature, not a bug that quantstrat requires a "hack" to allow you to execute on the same timestamp as a signal. It is potentially very dangerous to assume that you will be able to enter an order at the same time you generate a signal. You can make the argument that the assumption isn't as dangerous on lower periodicity data, but we believe the defaults should be more conservative, not less. Thanks for the comment. I think the crux of the matter is whether you have price-based vs time-based entries/exits. Agree with you on the potential for negative surprises if you assume you can execute on the close of a close price-based signal – although this can be mitigated in production by calculating the indicators in real-time (assuming the strategy passes all the development backtests). However, for time-based entries/exits (of which the FOMC cycle strategy is one), it’s certainly valid to allow execution on the same bar close, cos you know it in advance e.g. sell on T+5 close. The question then is not if you will trade but at what price relative to the close. And my preferred approach for dealing with this is to set the price as the close and handle slippage/implementation shortfall in the execution cost function. I’m not saying it should be the default, but the option to choose would sure simplify coding. How you generate the signal doesn't change the fact that it is impossible to execute on the same timestamp as used to generate the signal. It doesn't matter if you calculate indicators in real-time in production. There's still a non-zero calculation time. Even if it only takes a few microseconds, it's still not the same timestamp. quantstrat was written to model signals and orders as realistically as possible. Assuming execution on the same timestamp as a signal is not realistic. Like I said in my prior comment, you can argue that execution on the same timestamp as the signal isn't as unrealistic for lower-periodicity data, but it's still not realistic. For example, what if you have 1-second bars instead of daily? And there's already an option to do what you want. It's "allowMagicalThinking=TRUE". I forget where you need to set it, because I never use it. It will probably get passed via "...", so you could try adding it to applyStrategy. I assumed this was what you were using when you said "hack". Good to hear that the option does exist but I didn’t see it documented if it is (noted that Quantstrat is still under heavy development and that you want to discourage such use). Like I said, for this particular strategy, it’s reasonable to use it because these are time-based signals e.g. exit after 5 days. Indeed, in real life there exists the Market-On-Close (MOC) order type for executing on the daily close. No magical thinking needed, and yes I do use them e.g. on Monday 23 March in the SPY my MOC order was executed at the closing price of 210 and the Interactive Brokers (IB) timestamp was 4pm exactly. You can see a video here from IB on this order type http://ibkb.interactivebrokers.com/video/1232. And for more detailed info on this market microstructure topic, here’s a quick guide from NASDAQ on “The Closing Cross” https://www.nasdaqtrader.com/content/TechnicalSupport/UserGuides/TradingProducts/crosses/openclosequickguide.pdf. My point still holds. You must enter your MOC order before the close of the session you want it to execute in. A realistic simulation environment should reflect that. While it may not be unreasonable in this very specific situation (time-based entries and exits using only market orders), it's still extremely bad process and potentially dangerous. What if someone takes this strategy (with allowMagicalThinking=TRUE) and modifies it? Maybe they add a non-time-based signal. Maybe they use an order other than market? Now they're in a bad spot and they likely don't even know it. To be clear, for this strategy it is definitely reasonable (nor is it bad process or dangerous) as the signals are known well in advance (days) before any trading takes place. I agree that this may not be the case in general, hence my previous comment that one needs to do one’s own homework accordingly. This is going to be my last comment. Feel free to have the last word. I agreed that it may be reasonable for this specific strategy, but I still disagree that assuming execution on the same timestamp as a signal (and order entry) is not bad process nor dangerous (that is to say that it is bad process and dangerous). The assumption being reasonable for this specific strategy is an exception, not the rule, and exceptions should not dictate process. Process should be independent of any specific strategy. Just looking at the chart, I was wondering if the fomc returns could be used as a forward indicator of market health. Seems like when the fomc curve starts outperforming the regular SPY returns, the market is tanking. I just can't tell from the low res graph whether this precedes or follows market bad behavior. So I thought I'd propose it as a possibility.